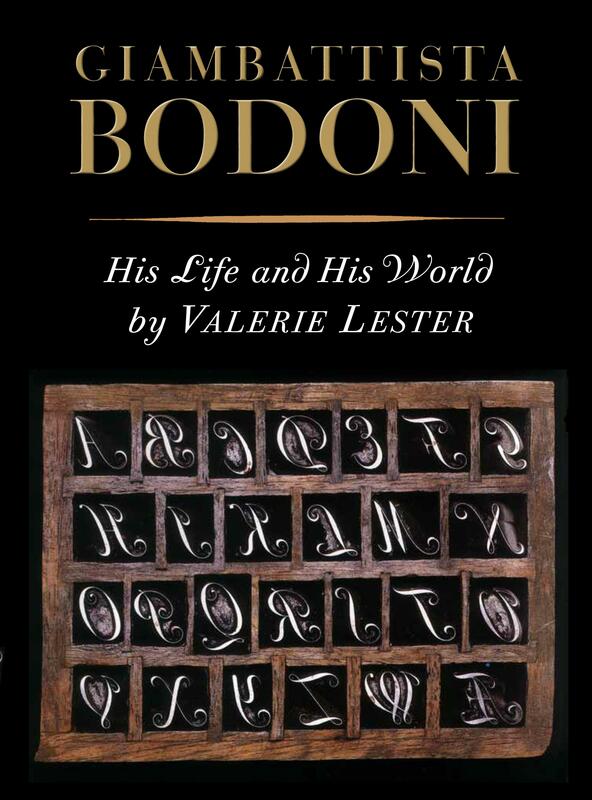 Valerie Lester, Giambattista Bodoni: His Life and His World. David R. Godine, Publisher; Boston, 2015, 288 pp., ill. US$40.00. ISBN 978-1567925289. Rarely is a subtitle as precise as the one of this book by Valerie Lester. The reader who buys it will get exactly what is advertised: the description of Bodoni’s life and world—no less, and no more. A biographer of a scientist, an inventor or an artist has the following problem. How can one describe the work of the person without making the biography become a textbook in the corresponding field: relativity theory, or carburetor engines, or post-impressionism? Such a textbook inevitably is both too much and too little: the lay public is often lost in the technical details, while experts complain of the simplifications and pedestrian approach. It is very difficult to create a book about a complex subject which remains interesting for both the general public and specialists. Many biographers have been defeated by this task. A way around this problem is to refuse to write too much about the intricacies of the person’s work, focusing instead on his or her life, on the premise that a genius is interesting not only because of what he or she did, but also because of what he or she was. The popularity of biographies of Einstein, Turing or Dante shows that even people not much interested in physics, mathematics or medieval Italian poetry & politics may be fascinated by these remarkable lives. Moreover, biographies written in this style, as life stories rather than work stories, may also be of considerable value for experts. While the latter know only too well what the geniuses did, their backgrounds sometimes provide insights into why they did it. This is especially true with respect to artists’ biographies, where the background is immensely relevant for the art. The best books of this kind give the reader the feeling of becoming acquainted with their subjects, of knowing them rather than knowing about them. This book by Valerie Lester is an excellent example of this style of biography. It does not try to be a dissertation on typography. You will not find there a discussion about Garalde vs. Didone; nowhere does the author mention the difference between humanist and modern axes or other favorite topics of font cognoscenti. Instead she tells us about Giambattista Bodoni himself and his life. Still, many details of his life as told by Valerie Lester are useful to understand Bodoni’s contribution to the art of typography. For example, one of the striking features of Bodoni’s legacy is the huge set of polyglot alphabets (one can enjoy the diversity of scripts in the reprint edition of his Manuale Typographico; see the review in TUGboat, Volume 32, No. 3, 2011 (http://tug.org/books/reviews/tb102reviews-bodoni.html). It is important to realize that Bodoni’s interest in non-Latin scripts was caused by his youthful apprenticeship in the typography of Sacra Congregatio de Propaganda Fide (now Congregatio pro Gentium Evangelizatione), the missionary branch of the Roman Curia. Further, it is from the biography that one can conclude that the huge amount of ephemera published by Bodoni was the result of his position as the ducal printer in Parma as well as owner of a private press. It is fascinating to read about Bodoni’s learned friends like Spanish diplomat José Nicolás de Azara chiding the typographer for wasting his talent on these works. One may think the life of Giambattista Bodoni was rather uneventful: he spent most of his life as a well-respected printer in Parma, happily married (albeit childless) and making many beautiful books, brochures, broadsides and other printed matter—as well as an immense quantity of punches for a huge variety of scripts. To the contrary, however, Valerie Lester tells a fascinating story of a great artist trying to live a fruitful life in a stormy world. This was a time of great political upheaval in Europe: the French revolution, Napoleonic wars, diplomatic intrigues. The Italian states around Bodoni changed their borders and allegiances. Bodoni responded to these calamities in his own way: he just worked more, producing beauty for the uncertain world. This is a powerful story with relevance even now. Although no portraits exist of Bodoni as a boy, those that appear after his arrival in Parma reveal a handsome man who steadily gains girth as he grows older. He clearly relishes his food; perhaps he enjoyed it too much, as gout would later suggest. One thing is certain: the food on offer in Saluzzo in his early years was of the highest quality, reflecting the cosmopolitan nature of the place. Il cuoco piemontese perfezionato a Parigi is a marvelous book, published in Turin in 1766, and giving the idea of the kind of food available to the growing Bodoni family. Its anonymous author (most likely a man) follows the order of the seasons, starting with spring, which he calls the most pleasant season of all, but sadly lacking in chicks and ducklings, small birds, vegetables, and fruit. However, young hares and rabbits, piglets, lambs, calves, and kids abound, and fortunately beef has no season. Nor do eels and frogs. (Frog fricassée is a featured recipe.) Freshwater and saltwater fish are available. Artichokes, asparagus, certain kinds of mushrooms, peas, cardoons, spinach, lettuce, turnip tops, sorrel, and chervil come into season, as do strawberries, gooseberries, and cherries. Summer sees an increase in poultry, game, and other birds, including songbirds. Beans, cauliflower, cabbage, and onions appear, along with peaches, plums, apricots, figs, currants, mulberries, melons, and pears. Autumn brings a bounty of fish, meat, cool weather vegetables and fruit, with the welcome addition of nuts, olives, and a huge variety of grapes. The lean winter months of December, January, and February, see an increase in the consumption of dairy products and dried and preserved food. Then, with the same abundance reminding one of Dutch still life painters, Valerie Lester talks about coffee (“How tempting, but forbidden, the local cafés must have been for the young Bodoni”), wine, religion, festivities, and many, many more details of Italian life of these years. In 1285, the citizens of Parma raised funds for the creation of a bell that could be heard as far away as Reggio Emilia, 26 kilometers distant. The first bell to be cast was not up to the challenge. A second bell, very beautiful, also failed the test, but in 1287, a third bell, Il Bajon, was struck, and this time the citizens were satisfied. (It is unclear, however, whether it actually made itself heard in Reggio Emilia.) Because of its enormous size, it was subject to rupture, and has been recast seven times since 1287. Strict regulations dictated that Il Bajon, the largest of the six bells in the cathedral tower, would only toll for the deaths of heads of state or members of Parma’s most illustrious families. When the populace awoke on 30 November 1813 and heard the great bell tolling, it was clear that someone very important had died. While the world of the book is full of things big and small, the author also loves to write about people. Bodoni’s press in Parma became a favorite destination for many discerning visitors from Napoleon to traveling scholars. Even more people corresponded with Bodoni (a shrewd businessman, Bodoni sent a number of his books as gifts to various dignitaries including such distant ones as Benjamin Franklin, a printer himself). This gives Lester an opportunity to include portraits in her prose: sometimes long, sometimes short, but always vivid and interesting. Besides Giambattista and his wife Ghitta (a printer herself, who brilliantly finished her late husband’s huge Manuale), the reader gets to know many contemporaries of the typographer: poets, printers, artists, kings, queens, princes, princesses, ministers, ambassadors, cardinals, apprentices, thieves and many others. Everyone is distinct and clear, like the characters in Bodoni’s characteristic fonts. The author’s language is easy and conversational. Sometimes it becomes perhaps too chatty, and Valerie Lester’s levity may occasionally seem overdone, as in “Saluzzo! Even the word sounds salutary, like a blessing for a sneeze.” At times it seems that the copy editor missed an unfortunate word or phrase, for example, “Even though Bodoni’s biographer, Giuseppe De Lama, presumably getting it straight from the horse’s widow’s mouth holds firm for [Bodoni’s birthday on] 16 February […]”. Still, these occasions are rather rare, and the book overall is well written. The book is well researched. It has 220 endnotes, quoting many sources, often not readily accessible, including the author’s correspondence with a number of experts. The Selected Bibliography has 73 titles. This is very good for a popular biography. While the author, as mentioned above, does not try to go into the intricacies of typography, she adds four specialized appendices written by experts: Cutting a Punch and Striking and Fitting a Matrix by Stan Nelson, Printing on a Hand Press by Fred & Barbara Voltmer, and The Trieste Leaf by James Mosley (about the missing leaf from the 1788 edition of the Manuale). These appendices are well written and should be interesting both for the general public and for lovers of the art of typography. Besides these appendices, bibliography and notes, there is a list of Principal Characters, divided into sections corresponding to the cities where the reader meets them, a nice map of Bodoni’s Italy, and an index occupying ten pages of small print. The book is abundant with illustrations. It shows leaves from Bodoni’s books, from the books of his predecessors and competitors, as well as portraits, landscapes, and photographs. It has 28 plates (18 portraits and 10 plates of printed works), and a hundred more illustrations in the text, frontispiece, front and back end papers. Despite all this illustrative material, it does not give an impression of a coffee table book, intended to be leafed through rather than read: the pictures and photographs blend with the text. This is a notable achievement of the book designer, Jerry Kelly. Speaking of this, I must say that a book about a great typographer places a high burden of expectation on the designer. It would be a disaster to publish a pedestrian-appearing book about a master of fine printing: too big a contrast. Fortunately, Jerry Kelly, a leading typographer, scholar and type designer himself (in October 2015 he received a prestigious Frederic W. Goudy Award; we have reviewed several of his books in TUGboat) was chosen, and was more than up to the task. Fittingly, he typeset the book in beautiful ITC Bodoni and Bauer Bodoni. The proportions of type block, margins and marginal folios are exquisite, the typesetting is tasteful, and blending of text and illustrations is subtle. Kelly provided a number of illustrations for the book himself and drew the map of Bodoni’s Italy. One feels that this was a work of love for him, a tribute to the classic of typography. The book is printed on good stock and well bound. In our age of electronic books and sometimes shoddy typography it is a pleasure to see that the traditions of fine bookmaking are still alive. The book was published by David R. Godine, a small independent company specializing in fine printing of “general interests for those with specific interests”; we have a note about it by Dave Walden in this issue. I thoroughly enjoyed this book. I think it would find a good place on the bookshelf of anybody interested in the art of typography, the history of Europe during the French revolution, the past and present of Italy—and anybody with an appreciation for an interesting and beautiful book.